The 2018 NDBS fall meeting will be held on October 6th in Lisbon. Focus will be area wetlands and the Sheyenne River Valley. We will try to find as many species as possible as this date will coincide with eBird’s first annual October BIG DAY. Meet 7AM at Island Park Motel (Lisbon - 701-683-4114) to carpool in the area. Birding plans for Sunday will be discussed at dinner (TBD). Spring 2017 - SW Specialties! Spring 2017 meeting will be held at the scenic Logging Camp Ranch in sw ND. The dates are June 9-11, 2017. Our previous meeting there many years ago was a big success, you will not want to miss this event. We will look for all of the sw ND specialties, including Long-billed Curlew, Greater Sage-Grouse, McCown's Longspur, Common Poorwill, Violet-green Swallow, Western Wood-Pewee, 'Audubon's' Warbler, Brewer's Sparrow, and Bullock's Oriole. To reserve your spot, contact Ron Martin at jrmartin@srt.com. They will fill up fast! The North Dakota Birding Society will meet in Devils Lake Nov 19-20, 2016. This should be prime time for rare waterfowl, and south bound winter finches. As usual, we will have a Saturday evening dinner and social. Contact Corey Ellingson if interested at crackerjackbirder@bis.midco.net. The North Dakota Birding Society will meet in Wahpeton May 21-22, 2016. This should be prime time for migrant warblers and shorebirds. As usual, we will have a Saturday evening dinner and social. Friday night meet at the Baymont Inn @7pm for evening birding in Wahpeton if you arrive early. Meet @6am, Saturday May 21st at the Baymont Inn for field trips. An evening meal will be planned for Saturday. Sunday morning will be one last field trip in the area before dispersing. Contact Info: Baymont (701) 642-5000. The North Dakota Birding Society will meet in Fargo May 23-24, 2015. This should be prime time for migrant warblers and shorebirds. As usual, we will have a Saturday evening dinner and social. More details to come later for a meeting place the first morning, and a Saturday dinner. The ND Birding Society will meet Sept. 27-28 in Devils Lake. We will once again take to the pontoons and cruise Devils Lake in search of Sabine's Gull, Little Gull, and other fall migrants. The group meets at 7:30am at the Spirit Lake Casino marina that morning. A fee of roughly $30 is required to cover the cost of the pontoon rentals. An alternative date would be Sunday if bad weather or wind. 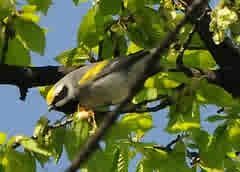 Join us as we explore Pembina Gorge country and Icelandic Park the weekend of May 24-25, 2014 for sought after woodland species. Meet at 6:00am at Cedar Inn, Cavalier for Saturday carpool and field trips. A group dinner will follow that evening back at the Cedar Inn. May 25th and 26th 2013 - NDBS will explore the aspen forests of the Killdeer Mountains. This area will be checked for western species, and eastern strays. For the waterfowl and shorebird enthusiast, Lake Ilo nearby will be another stop. Due to the high level of oil activity, the lodging will be at Eastview Campground in the hills. Log cabin lodges are available for rent. Please notify Corey Ellingson at (701) 221-0644 if you plan to attend. Email is crackerjackbirder@bis.midco.net. Eastview campground would like to know the number of people in the group, and I will monitor availability of space. The NDBS fall meeting is scheduled for August 25-26 in the Turtle Mts. Our base will be the Super 8 Motel in Bottineau. The number for the Super 8 is 701-228-2125. We will meet in the parking lot at 6:30 am on Saturday, Aug. 25 for field trips. Saturday evening we will have a meal and meeting at a place to be determined. Good numbers of warblers should be moving through the area at this time of year. Lord's Lake and the surrounding area should be good for waterfowl and shorebirds. For lodging accomodations, check at the Super 8 in Lisbon. 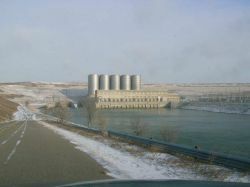 The best weekend to visit Garrison Dam is Thanksgiving weekend - Nov 26th/27th 2011. This date lends to late Bonaparte’s and Mew Gull. Migrants as Iceland Gull and Glaucous Gull begin. Last winter was a banner year for Black-legged Kittiwake. In addition to peak variety of gulls, the freeze-up across the ND landscape pushes scoters and late waterfowl to Lake Audubon and Lake Sakakawea. Lastly Snowy Owls begin to arrive, along with the rare Gyrfalcon in the farmlands to the southeast. Accommodations are being arranged along with a Saturday evening dinner at the Riverdale High Lodge/Bar & Grill. Over the past several years, an "inland pelagic" has been arranged on a pontoon to search for rare gulls on the other "big lake - Devils Lake. The searches has been successful for Sabine's Gulls and sometimes Little Gulls in the past. The group meets at the Spirit Lake Casino marina that morning. A fee of roughly $25 is required to cover the cost of the pontoon rental depending on participation. An alternative date would be Sunday if bad weather or wind. Date: August 7th and 8th. The location selected was southern Dickey county, with a home base of Oakes. Just across the SD border near Hecla, the marshland has expanded tremendously in the last few years. As a result, SD birders have found Least Bitterns, Tricolored Heron, Little Blue Herons, Glossy Ibis and Great-tailed Grackles. The hope is to take advantage of wandering waders the beginning of August. Scheduled for May 22nd and 23rd in Devils Lake, we will search this relatively underbirded area. Let's hope for the good birding of past - 2008 Grand Forks, and 2009 Minto/Grafton. 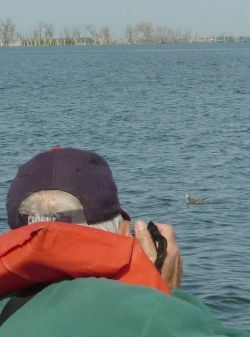 On Sept 26th, 7 intrepid birders braved the waves on a pontoon trip on Devils Lake. Wind started southwest at 10-15, but diminished throughout the day. With the warm fall, an abundance of (5000) Franklin Gulls still persisted. Early on, a first year type Herring Gull had our hopes up for Black-backs, but not to be. It took 3 hours to find our first Sabine's Gull. It was very cooperative, check out the photo taken by Stacy Adolf-Whipp! Two more Sabine's were observed. 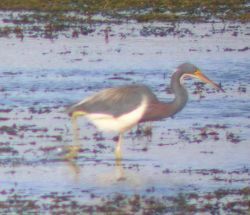 Other birds included 8 Great Egrets, Western Grebes (and a Clark's was later found on a photo!) but not noticed by us! ), and the assortment of waterbirds. Later off the boat, a flock of 70 Hooded Mergansers were seen, along with an Am. Black Duck. The woodland was checked in Sullys Hill NGP but very few birds were present. It was surprising to see the effects of high water. All the buildings have been removed, with a new Visitors Center built up high. A hike into the Sullys Hill lake is required, with the road encircling now partly covered with water. Only highlight was a Pileated Woodpecker heard calling and drumming. Otherwise Yellow-bellied Sapsucker, Kingfisher, E.Phoebe, RC Kinglet, Orange-crowns, Yellow-rumps, White-throated Sparrow, and DE Junco. 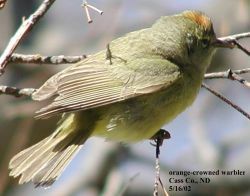 The North Dakota Birding Society participated in fieldtrips based out of Grafton. This area of ND includes the counties of Pembina, Cavalier and Walsh. Saturday morning, the majority of the participants toured Pembina country with Dave Lambeth leading the way. A second group of birders focused on Grafton, Minto, and the Drayton Lagoons. Eighteen species of warblers were seen including a MALE Black-throated Blue in Minto. Others included Cape May, and Blackburnian. At the Drayton Lagoons, hundreds of shorebirds were present, including Black-bellied Plover, Ruddy Turnstone, and 175 Hudsonian Godwits. A flyover Peregrine Falcon was seen each day also at the lagoon. Aug 22-24 at Westby (NE corner of Montana near Plentywood, MT and west of Crosby, ND). The weekend itinerary for 24(!) participants included birding the Grand Forks Greenway, GF Cemetery, Kellyâ€™s Slough NWR. Barred Owl, Peregrine Falcon, Black-billed Cuckoo, N. Mockingbird, 19 warblers including - Golden-winged, N. Parula, Cape May, Black-throated Green (4), Blackburnian, Bay-breasted(3), with lastly Scarlet Tanager and Eastern Towhee seen by all. 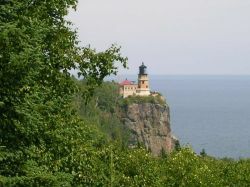 Fall meeting: Duluth, MN, with birding trips on Sept 28-30th. Twenty-one participated recording roughly 95 species in MN and WI. Highlights included Scoters, Red-throated Loon, Parasitic Jaeger, and Lesser Black-backed Gull. The weekend of May 26th and 27th in Williston, ND. Twenty+ participants attended and came as far as Thief River Falls, MN and from Sidney, MT. 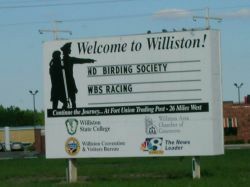 The Williston folks led two different groups of cars to some areas for birding. Jim & Analene Torgerson at www.lundslanding.com hosted both groups to Juneberry pie and allowed us to bird the area. Both Bluebirds, Say's Pheobe, and Lazuli Bunting were easily observed. Jim reports a NORTHERN MOCKINGBIRD in the area but no luck. Jim also showed the first group the resident Long-billed Curlew pair, and a surprise was a flyover Common Loon. The second group did not locate the Curlews, but had several Sprague's Pipits during the search. The place is worth a visit! Strawberry Butte provided looks of Rock Wren and a Golden Eagle. After lunch in Williston, both groups visited Alkali Lake just north of Appam ND. Of nearly twenty species of shorebirds tallied were Piping Plovers, Black-bellied Plover, and Dunlin. The shorebirds were very jumpy however as TWO Peregrine Falcons were working the flocks. On the return trip a Ferruginous Hawk, Loggerhead Shrikes and Chestnut-collared Longspurs were seen, along with a BLACK DUCK(!) flushed from a marsh. After a group meal at the El Rancho Motel, participants finished the trip at the Williston Marsh. Many Common Terns, a Black-crowned Night Heron, an Am. Bittern, and many waterfowl/grebes were observed in the beautiful setting sun - a perfect end. 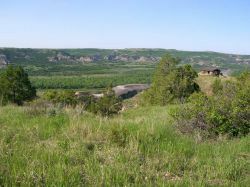 On Sunday, 7 participants made a field trip to the North Unit of the Theodore Roosevelt National Park. Thirty-five species were observed including the target Bullock's Oriole. A nature trail walk provided Yellow-breasted Chat and Orchard Orioles. A drive to the end of the auto tour provided (4-6) Violet-green Swallows along the way as they were observed flying along the clay buttes and working the nest holes. It is truly a spectacular place; due to the recent rains has never been so green! Our annual fall meeting and trips were held at Devils Lake on September 22-24, 2006. The tour groups covered the greater Devils Lake area, and recorded 146 species in a combined effort. The boat trips were blown out both days, which allowed everyone to see the true gem of the weekend - a Tricolored Heron found by Lake Alice NWR personnel on the 21st. The bird disappeared for two days, but was refound Sunday morning for all to see. The group checklist included 8 waders and 18 shorebirds. A secondary highlight was the presence of an adult Little Gull. Not everyone was able to observe this bird however. Also the massive cold front on the weekend provided the last push of warblers, and the first arrivals of migrant sparrows. A large group of birds at Sully's Hill provided good looks of late Blackpoll, Bay-breasted, Magnolia and Nashville warblers. On the flip side, the first arrivals of Brown Creeper, Winter Wren (3), Fox Sparrows, both Kinglets and many "whistling" sparrows moved about the lakeshore. Broad-winged Hawk, Pileated Woodpecker, and Eastern Towhee also made an appearance. Our annual spring meeting was held in the Turtle Mts. of North Dakota June 3-4, 2006. The tour groups covered the diverse habitats, and recorded 136 species in a combined effort. Trip leaders helped explore the many lakes and woodlands of this unique area. Target nesting species were found including Com. Goldeneye, Ruffed Grouse, Com. Loon, Red-necked Grebe, Broad-winged Hawk, Yellow-b. Sapsucker, and Pil. Woodpecker. Nesting passerines included Alder and Willow Flycatcher, Yellow-throated Vireo, Com. Raven, Veery, 10 species of warblers, and White-th. Sparrow. A migrating Olive-sided Flycatcher was found, along with singing LeConte's and Sharp-tailed Sparrows. A side trip to the very north end of J. Clark Salyer NWR produced some late migrating shorebirds, and wading birds. 17 species of shorebirds were recorded, as well as a Peregrine Falcon fly-by here the day before the NDBS trips. Twelve participants enjoyed a good day of birding. One group traveled to Garrison Dam and worked their way south. The others began the day at the Mandan Experiment Station, then traveled to Bismarck Landfill, McKenzie Slough and Long Lake NWR. The Bismarck group started at the Mandan Experiment Station, where several Townsend's Solitaires (regular here) were observed and heard calling. A number of deer hunters turned us away early however. On to the Bismarck Landfill. A 2 hour study produced a first winter Thayer's Gull, a first winter Lesser Black-backed Gull, along with a weird leucistic 3rd winter individual - pictured. At McKenzie Slough, highlight species were 2 "Baird's" Sandpipers (more later) and several Am. Golden Plovers also observed among 9 species of late shorebirds. Next stop was Long Lake NWR. All of the expected duck and goose species were observed. This included a large flock of the new Cackling Goose species that were observed and studied. Finishing out the day, a Common Loon was found from "C" Dike which is unusual at this location. Two more stops in woodland produced little of note. The Garrison Dam group had a good day with the highlight being not 1 (previously reported) Mew Gull but THREE(!) adult birds. Also present was a Thayer's Gull and Common Mergansers in the tailrace. 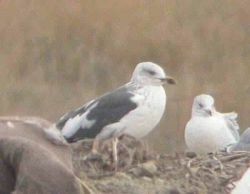 Upon returning to Bismarck, the landfill produced an ADULT Lesser Black-backed Gull which was different than the leucistic individual seen by others. 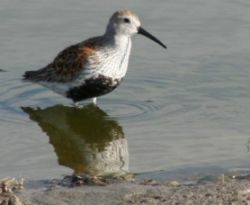 At McKenzie Slough, 2 (juv) White-rumped Sandpipers were identified. These birds were mis-identified by the first group as this species is unusual on the plains in fall, and this plumage (juvenile) even more rare. The NDBS combined fieldtrip lists showed a total of 91 species for the day - very good for nearly November and no doubt due to good gulls and a fairly mild fall thus far. When: Saturday May 21st and Sunday May 22nd, 2005 in Wahpeton. Saturday 8 people from the ND Birding Society participated. The park in Wahpeton was very slow with just a couple warblers and a Green Heron. We checked out the various ponds and lakes between Wahpeton and Tewaukon NWR and found a good variety of ducks, some grassland birds, Snowy and Great Egrets at Lidgerwood, and a Black-crowned Night Heron, and Cattle Egrets nearby. Shorebirds: Dunlin, Wilson Phalarope, Willet, Marbled Godwit, Least Sandpiper, White-rumped Sandpiper, Pectoral Sandpiper, and Spotted Sandpiper, Sanderling, Wilson's Snipe, and Ruddy Turnstones. Three Snow Geese at Tewaukon NWR as we left. During this hike, the wind switched from 30mph from the southeast, to 30mph from the northwest. Temps had reached the 80s and sun was shining bright. On that note - 4:30pm we had called it a day and disbanded. The entire warbler list included many Yellows, singing Tennessees, a couple Blackpoll Warblers, singing Ovenbirds at our last stop, and a couple Common Yellowthroats in the marshes along the way.